How do you, as a busy security executive or manager, stay current with evolving issues, familiarize yourself with the successful practices of your peers, and transfer this information to build a knowledgeable, skilled workforce the times now demand? With Security Leader Insights for Information Protection, a collection of timeless leadership best practices featuring insights from some of the nation’s most successful security practitioners, you can. This book can be used as a quick and effective resource to bring your security staff up to speed on security’s role in information protection. Instead of re-inventing the wheel when faced with a new challenge, these proven practices and principles will allow you to execute with confidence knowing that your peers have done so with success. It includes chapters on the collaboration between corporate and information security, emerging issues in information protection, and information protection regulations and standards. 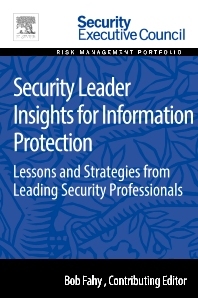 Security Leader Insights for Information Protection is a part of Elsevier’s Security Executive Council Risk Management Portfolio, a collection of real world solutions and "how-to" guidelines that equip executives, practitioners, and educators with proven information for successful security and risk management programs. Each chapter can be read in five minutes or less, and is written by or contains insights from experienced security leaders. Can be used to find illustrations and examples you can use to deal with a relevant issue. Brings together the diverse experiences of proven security leaders in one easy-to-read resource. Chapter 3. What Are the Characteristics of a Good Relationship Between Corporate Security and Information Security? John Masserini, Information Security Officer, Dow Jones & Co.
Chapter 5. Security in Cloud Computing: How Is It Different? Jeff M. Spivey, Director, Security Risk Management Inc.
Chapter 11. Is Your Data Leaking? Why All the Attention Now? Bob Fahy is currently the director of corporate security at Kraft Foods. He is a seasoned multidiscipline executive security management professional with over 20 years of varied international experience in conducting and managing complex investigations; assessing threats and exposures; designing cost-effective countermeasures to mitigate threats; obtaining stakeholder consensus; and implementing appropriate asset protection programs to include but not limited to information protection, food defense, supply chain, facilities, investigations, people situational awareness, brand protection, strategic risk profiles, kidnapping, and extortion. His broad experience in multicultural, multi-threat and multilingual environments provides unique skills in formulating policies and procedures, developing effective crisis management plans, obtaining valuable strategic and tactical threat information, and directing international complex financial fraud investigations on behalf of global stakeholders. Bob is widely known as an energetic team player and objective communicator with a history of aligning the security group and programs with the clients’ global and regional objectives.